The Sunbeams belong to a group of small butterflies in the subfamily Curetinae. In the field, the butterflies appear silvery white when in flight. Most of the species in the subfamily feature orange uppersides with thick black marginal borders. There are two extant species of the Sunbeams in Singapore, but it will not be surprising if the other species of the genus, which occur in Malaysia, are encountered here in the future. They are fast-flyers but are often encountered resting with their wings folded upright - either on top of leaves or at times, on the undersides of leaves. At certain times of the day, they will open their wings to sunbathe and to show their attractive upperside colours. 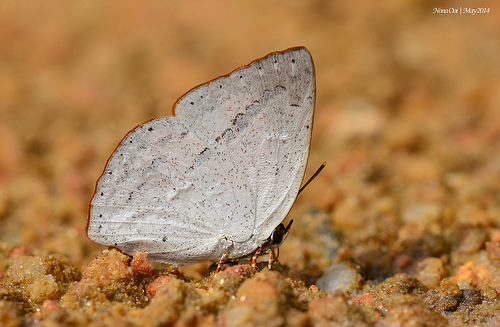 The Sunbeams are also often observed puddling at sandy streambanks, like this individual shot by ButterflyCircle member Nona Ooi. More shots of this pretty butterfly can be found here.